Applications: These brush wheels are designed for use on angle grinders of 115mm and above. They give rapid cleaning action on forgings, coatings and edges. They are most widely used on metal, but are also ideal for rubber, such as preparing tyres for repair, on wood for stripping and age effecting hardwood. Product Notes: Although made with crimped wire, these brushes are designed for high speed use (Max 13,000rpm). The crimped wire is brass coated steel, giving greater flexibility and longer life than pure steel brushes. They are also oil free and thus cleaner to use. 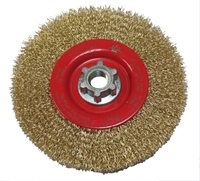 Also Available: For greater surface aggression, we also stock cup brush wheels suitable for use on angle grinders.